Are you struggling to find a case-capable support system to handle your case scenarios? A recent AIIM case management survey that discusses the limitations of traditional case management systems, reports that 45% of respondents use customisations, workarounds, add-ons or entirely manual processes to manage cases, and 32% say a better system would improve productivity. 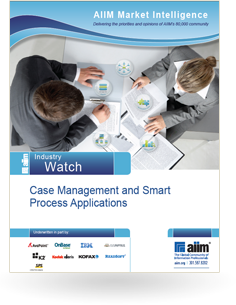 The report goes on to discuss a new generation of applications, called smart process applications that are better equipped than other systems to handle case management. K2 is pleased to make this report available at no cost. Download the full AIIM report to learn more key findings from the survey, which included over 300 respondents representing organisations of all sizes.